Frindsbury Extra is a civil parish divided into commercial, suburban residential and rural parts on the Hoo Peninsula in Medway, a ceremonial part of Kent. 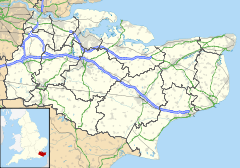 It is contiguous with the fully urbanised Frindsbury part of Strood and is bounded by Cliffe and Cliffe Woods to the north, Hoo to the east, and the River Medway to the south-east at Upnor (or Upnor-on-Medway) and a long, narrow meander of the river in the far south. On Medway Council it has councillors representing the Strood Rural ward currently on almost identical boundaries. Since 1998 it is one of 11 civil parishes in the Unitary Borough — approximately a quarter of the land of the borough is unparished for local administration. As with Frindsbury Intra, today known interchangeably as North Strood or Frindsbury, which is contiguous with Strood and immediately north of Strood railway station, Wainscott is south of the A20 dual carriageway. The rest of the parish is north of this road. The former council offices of Strood Rural District are in Frindsbury Extra. ^ a b Key Statistics: Population; Quick Statistics: Economic indicators. (2011 census and 2001 census) Retrieved 2015-02-27. This page was last edited on 2 April 2017, at 05:47 (UTC).